Like Airbnb for cars, FC's a peer-to-peer auto-sharing service from a trio of college dropouts (MIT, Harvard, and, ugh, Princeton) that lets you rent your car (and score free parking at Logan!!) while away on vacation, or on business, or at your cousin's graduation from ITT Tech. Option 1: "List Your Awesome Car"
After listing your ride and relevant specs on their site (it must be a 1999 or newer model w/ fewer than 150k miles -- and not worth more than $60 grand), call while en route before dropping it at their East Boston lot. After chauffeuring you to the terminal and potentially providing a goodbye hug, they'll wash your wheels and try to rent 'em. If somebody bites on your '04 Neon with a "fitful" transmission, well, consider yourself the proud winner of $10 a day in gas cards. If not, well, then you just scored gratis parking (at $27 a day) for the duration of your trip to Cancun. Win. Win. Option 2: "Rent a Sweet Ride"
Or... headed to the Cape this weekend and not down with Enterprise's sometimes-kind-of-over-the-top enthusiastic customer service? Understandable. Then rent the Taurus of some dude who's away in Cancun and score up to half-off what you'd pay for a standard rental. Only difference: a) you can be 18 (!! ), b) they do a three-year check of your driving record, and c) you only get 90mi a day. But... they do throw in a free insurance, GPS, and 24/7 roadside assistance. Now, do you enjoy watching narrated promotional videos that explain how things work using fun graphics & catchy music? Yes? Good -- then pull up a chair next to your sweet, sweet Neon and make with the watching. It’s official. 2013 will forever be known as the year smell-o-vision became a reality, and to think it wasn’t some fancy scientist who figured it out. It was a freaking pizza place. Dominos Brazil teamed up with local video rental stores to devise a genius advertising strategy: When the DVDs are placed into the player they look like your average movie disk. The secret lies in the thermal ink that activates as your movie plays. 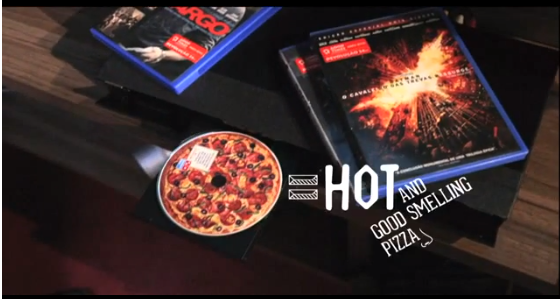 As the temperature of the disk increases throughout your movie of choice, the ink starts to create an image and releases a pizza aroma. When the disk is ejected, the disc has magically transformed into a “mini pizza” baked up hot and fresh in your player. (Although, don’t try to eat it — it’s still a DVD in disguise.) There’s even a friendly message on the disk encouraging movie fans to pair their next showing with a Dominos pizza. Even if you’re not a fan of Dominos, you have to give them props for coming up with such an “out of the box idea.” Heh heh.